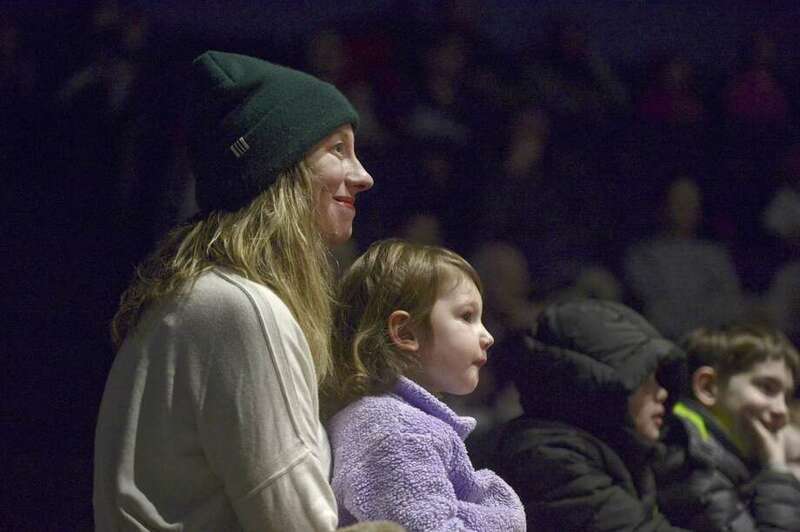 Kimberly Wallengren, of New Preston, holds her daughter Bellamy, 2, on her lap as they watch Peter Rabbit at the 13th annual puppetry festival at the Washington Montessori School in New Preston. Washington Montessori School in New Preston held its 13th annual puppetry festival on Saturday morning. The festival, presented by National Iron Bank, Sawing High Climbers and Stars Hollow Yarns, featured a puppet show by John McDonough of Pumpernickel Puppets. The puppetry festival has become a much-anticipated event here at the school said Jill Skilton, director of communications at Washington Montessori School. The shows have proven to be a fun and easy way for parents to spend time with their active children on those cold, winter mornings, she said. In addition to the show on Saturday by John McDonough of Pumpernickel Puppets, the will be additional shows on February 9th, with Jim Napolitano, who will share the story of Jack and the Beanstalk, using songs, stories and more than 80 handcrafted one-of-a-kind shadow puppets, and February 16th, with Charlotte Dore of Rosalita’s Puppets, which will feature a one-of-a-kind marionette show that tells the story of a princess who is finally able to prove to her uncle that unicorns truly do exist.